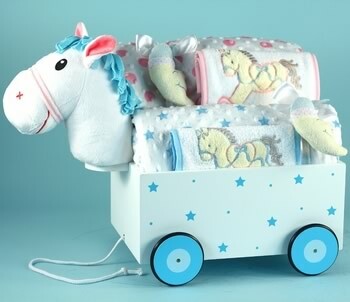 Welcome the new twins with this adorable horsey play wagon filled with much needed blankets, bibs and toys in color combinations for girls & boys! This one of a kind play wagon is certain to make a big impression as the centerpiece of this unique gift for twins and it�s not just a decoration! Designed as a pull toy, the wagon features wooden construction, painted and embellished with an appealing horsey head and tail with a pull rope for lots of creative playtime fun. It measures 22 by 10 inches, stands 16 inches tall and meets all American safety specifications. Children age 3 and under should always be supervised by an adult while playing with it. Inside the wagon, the new parents will find some practical additions to the babies collection of necessities. All of these layette items are of the utmost quality and completely made in America using only the finest American cotton fabrics. Please select the twins genders when ordering to select pink or blue accent colors. The entire ensemble arrives fully gift wrapped in opaque white tulle for a truly spectacular appearance.